Whether you're looking for secure vehicle storage, additional space for sports equipment or lawn supplies or want to create the ultimate handyman's workshop, Stoltzfus Woodworks has a garage to fit your needs! All of our garage models can be easily customized with a variety of options for added value and functionality! Need help choosing the perfect garage? Contact Stoltzfus Woodworks today! The perfect garage for a single vehicle, convenient storage or a small hobby shop, the A-frame garage offers classic styling you'll appreciate. Choose from Duratemp painted siding or add maintenance-free vinyl siding in a multitude of colors. Features entry door, overhead garage door, heavy-duty garage floor and two windows. Enjoy all the features of our barn-style roof to accommodate your overhead storage needs. Choose from Duratemp painted siding or maintenance free vinyl. Add an optional loft on both sides for even more storage space. Comes complete with overhead garage door, entry door and two windows. Looking for the ultimate workshop or studio? Or would you like to store your car on the first floor and use the 2nd floor for storage? The possibilities are endless with our two-story, single car garages. Our barn-style roof offers more headroom for all your gear. Our barn-style roof include an entry door, overhead garage door, stairway, second floor loft and 2 windows. Add a set of double doors on the 2nd floor to accommodate larger items or add an upstairs window for more natural light. Need convenient, secure storage for 2 vehicles? Our double-wide garages easily accommodate up to 2 vehicles or offer plenty of space for a workshop or hobby center. 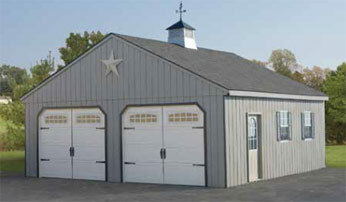 Our double-wide garages are delivered in two halves and assembled on your prepared site. Features include 1 entry door, 2 overhead garage doors, 2 windows and A-frame style roof. Choose from Duratemp painted or maintenance-free vinyl siding. Double-wide garages also feature a heavy-duty garage floor for added durability. ©2019, Stoltzfus Woodworks LLC, All Rights Reserved.